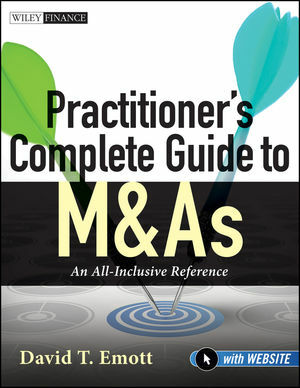 Practitioner's Complete Guide to M&As provides the practical tricks of the trade on M&As: what they need to know, what they have to know, and what they need to do. Numerous examples and forms are included illustrating concepts in discussion. Covers strategy development; deal flow and target identification; due diligence; valuation and offers; tax structuring; negotiation; and integration and value creation"
This practical guide takes you through every step of the M&A process, providing all the necessary tools that both the first-time M&A player as well as the seasoned practitioner need to complete a smart transaction. DAVID T. EMOTT is a seasoned manager with over twenty-five years of progressively greater responsibility in directing corporate strategy development, M&A and joint venture initiatives, performance measurement, strategic planning, control, financing, information technology, and tax planning activities in international and domestic theaters. He currently runs his own consulting business, D.T. Emott Advisory LLC, which provides services to buyers and sellers of companies or operating units.